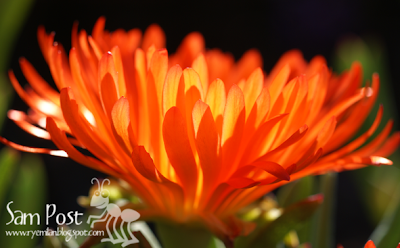 They were looking so stunningly bright and splendid down in the garden that I felt compelled to go and take some pics of them. I can't help but feel sunny looking at these flowers. I hope that your day is a sunny one too! PS. I just wanted to add that these colours are the real deal...they have not been photoshopped, other than a little cropping and addition of watermarks. Must be because it's the start of spring, I took photos of flowers today too, mine were yellow freesias, the burst of colour makes me feel happy. Wow - what gorgeous photos Sam. 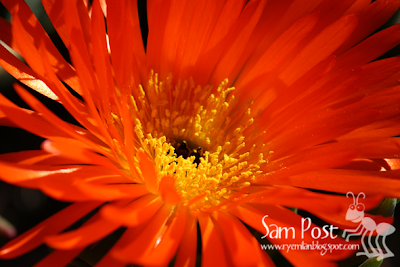 I love orange pigface - it is so vibrant and makes you feel good just looking at it, doesn't it?! I have a lavender pigface which is just about to flower. One of the best things about pigface is that they grow easily from cuttings and are so hardy - something we need here in Melbourne! I've never watered mine, yet it survived the summer in a very dry garden bed.